Well, one WIP and one finished object. First up, I knit my husband a Circulus, designed by Sarah Sipe, whom I interviewed earlier. I’ve already given it to him because he needed a new winter hat and walks to work. It’s longer than the pattern calls for because he’s got a giant head. I was having trouble keeping the slipped stitches in the cable from looking sloppy, so I knit them instead. Try it as written first, though – I like the way Sarah’s original looks! Next up, I’m working on a Sacre Coeur, by Nim Teasdale. She’s new to me – I learned about her in the Giftalong, and am delighted by her patterns. I was looking for a pattern that would be good in mohair (because I won some in last year’s Giftalong) and that would let me knit until I used up the yarn. Nim’s patterns are designed to be flexible – go have a look! Here is her blog: Little House on the Hill. 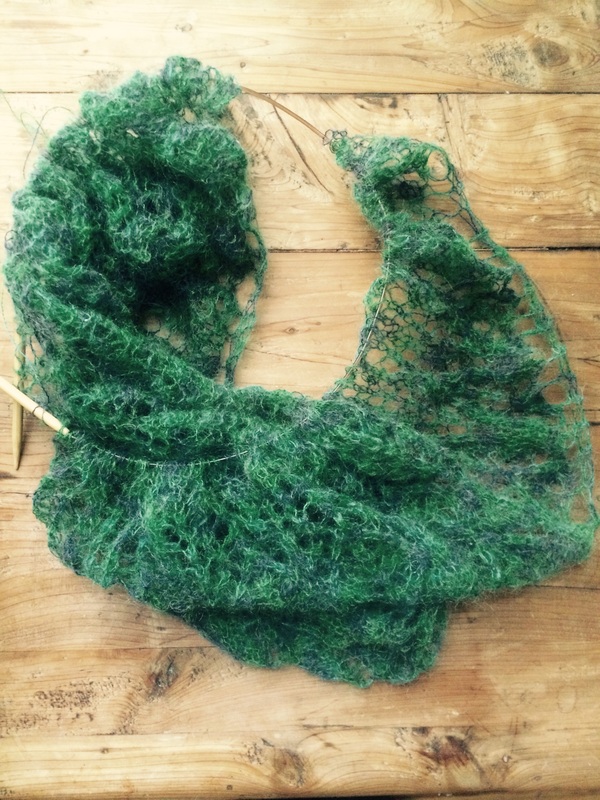 The shawl has gotten big enough that it’s hard to see much of it on the needles. I’m almost half done. I’ve been slowed down by Thanksgiving and a cold, but I’m looking forward to more knitting time this week. This one might be a present for me, or it might not – we shall see! Justyna is primarily a toy designer – she has a lot of really cute crocheted amigurumis (and a few knit ones) and measuring tape covers, among other things. Her blog is full of delightful adventures – her crocheted “mini-me” took an international trip and she hosted a crochet mystery featuring the evil villain, Dr. Hookenstein. These are her patterns on sale for the GAL. 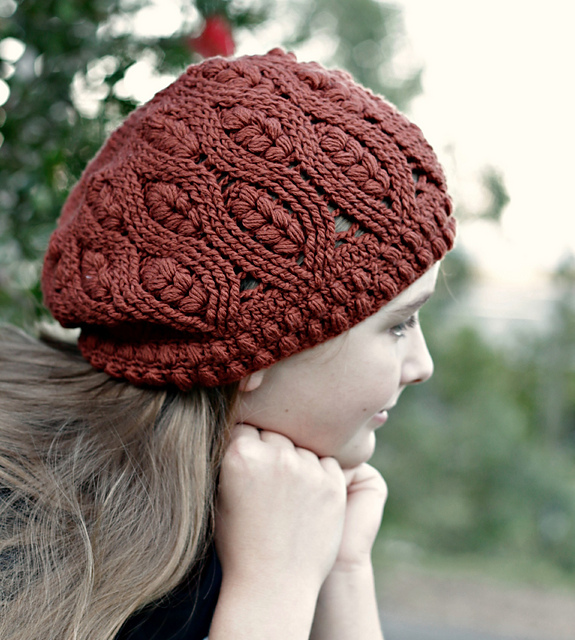 To celebrate the Giftalong, I’m going to be blogging four interviews with other designers who have patterns in the sale. Because the sale is only a week long, I’ve decided to give you all a chance to get their discounted patterns – the interviews will all be published this week! 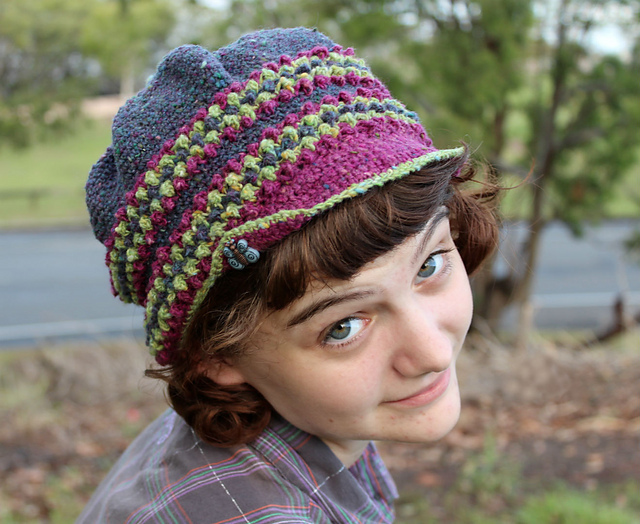 First up is Sarah Jane, a really creative crochet designer, whose work I’ve admired for quite a while now. If I could still crochet, I’d be making one of her patterns for the giftalong in a snap! Or Frostberry Hat, though that’s not on sale. Or… well, I’d have trouble making up my mind! Maybe some of her Steampunk collection? Well I don’t really know what to say…I am a 47 year old mother of 8…..7 live at home ☺ I like to say that it’s organised chaos but truth is there is probably not so much of the organised about it. Crochet was the first craft I ever learned and even though I’ve dabbled in lots of other crafts I always seemed to come back to crochet….with so many kids crochet is portable and leaves less mess than most other crafts (if you don’t count the stash and the UFO’s). Also it’s more difficult for babies to poke holes in themselves or others with hooks than it is with needles. Aside from crochet I love to read and occasionally knit. Housework seems to have become an optional extra around here! 2. Somehow you manage to combine crochet stitch patterns in ways that are really fresh and different. Can you name any particular influences that inspired this, or is it the stitches themselves that catch your eye? Thank you, I really appreciate you saying this. The stitches themselves always catch my eye, I love the textures and seeing how they work together. Colour and yarn is a big influence too…certain yarns and colours seem to call for different types of textures and stitches. I love certain styles, like steampunk and a romantic gothic type style and I think you can see this influence in some of my designs……reality is it doesn’t really take much to inspire me, it can be anything from the shape of a leaf to a combination of colours I notice somewhere. 3. What attracted you to joining in with the Giftalong? 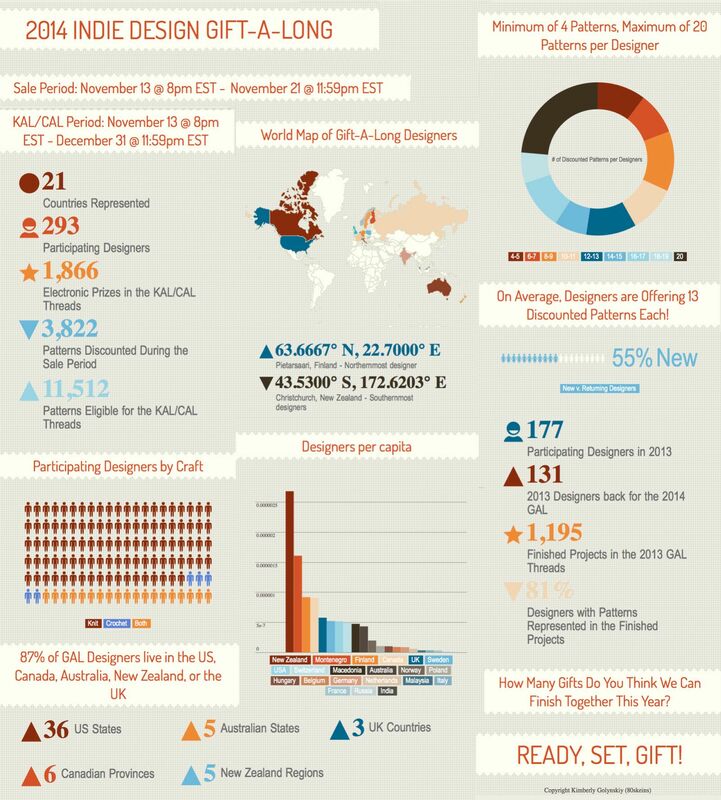 I participated in the giftalong last year after noticing it mentioned on the Designers board and I had a ball. It was a fantastic opportunity to meet and interact with both designers and crocheters/knitters. I didn’t expect it to become so big but this year it looks like it’s going to be even bigger. I have been really excited about it this year, for me it is all about the interaction. Here in Australia there aren’t too many opportunities to meet other designers so this is great fun. 4. What are a few patterns from the Giftalong that you’d really like to make? Goodness there are so many…I wish I had unlimited time and cooler weather ☺…..I love a lot of Darleen Hopkins crochet patterns but I just adore her Patchwork baby kitty throw. 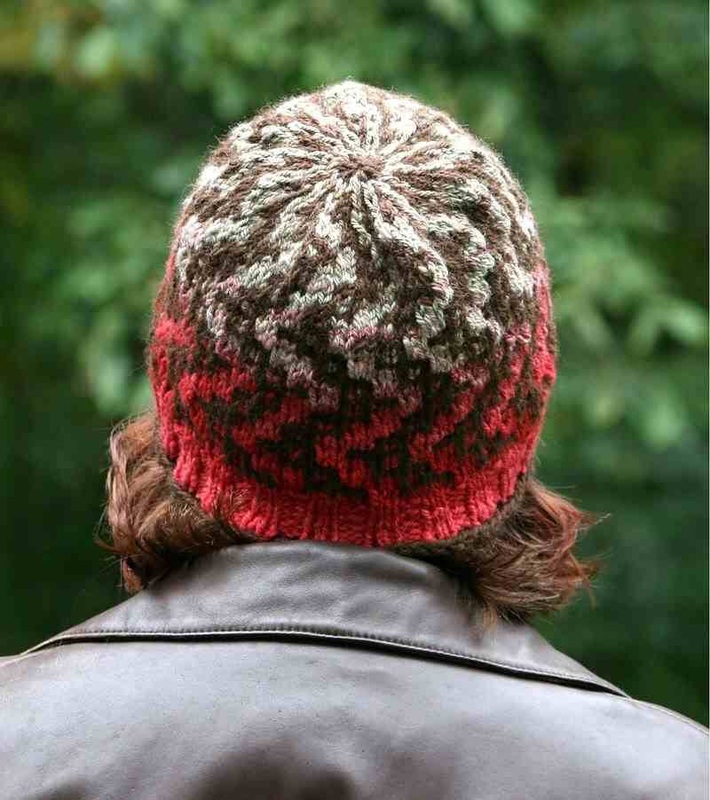 If I could I would make anything by Julia Trice (Mind of Winter on Ravelry) especially Loden. I love this shawl Leventry and I think this Minimissimi coat is truly spectacular even though I’d never be able to wear it over here. I could go on and on…..
5. Is there anything about crochet that you wish more people knew? That it’s easy…you can make anything if you work through it a stitch at a time and also that it doesn’t have to look like something from the 60’s or 70’s, crochet can be fashionable and modern as well as a bit different. Here are some of the places you can find Sarah Jane online! These are my patterns that are on sale for the Giftalong from Thursday Nov. 13, 8 pm EST, to November 21, 11:59 pm EST. 25% off! The giftalong starts at the same time, but continues through the end of the year.